Sequel to the enormo-RTS on Kickstarter now. 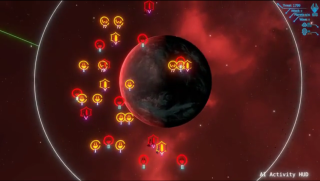 Arcen Games has announced a sequel to its enormo-space RTS AI War, which we called "one of this year's finest strategy games" back in 2009. AI War II will feature 3D models, modding support, the option to play as the aliens, and a load of other tweaks and additions to the already massive original—here's an online design document collecting everything that Arcen aims to put in the game. In addition to the things I just said, we can also expect improved AI, more ship types, and a new Science system that will let you "decide your army’s strengths and capabilities". The Kickstarter for AI War 2 went live yesterday, and has 30 days left to hit its target of $299,400. So far it's collected around a tenth of that. If all goes well, there'll be a private alpha version available in January of next year, followed by a public early access version in May, and the full release sometime in October 2017.